We started our day in Puerta del Sol, one the main popular squares in the city. 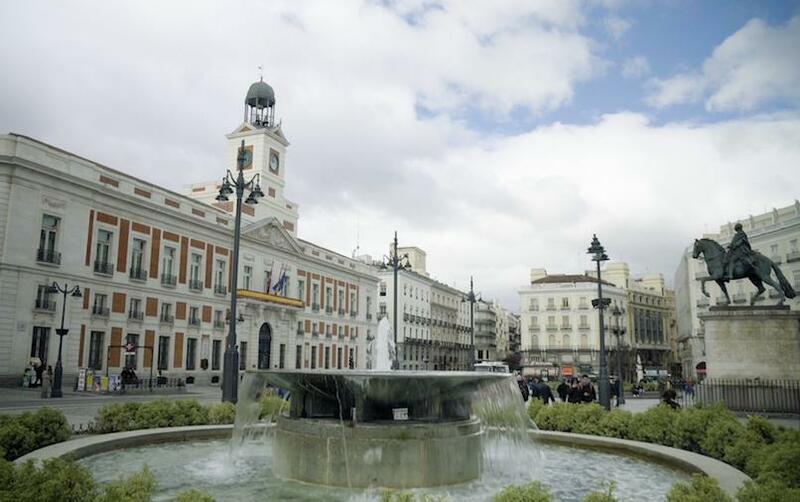 Puerta del Sol means ‘Gate of Sun’ and it originally was one of the main gates to Madrid. The square was also considered the main meeting point between the 17th and the 19th century, while nowadays is one of the most visited squares in Madrid. After taking some photos of the famous statues of the bear and King Carlos III, you can cross the street and find the so-called Kilometre Zero stone slab on the pavement just outside the Casa de Correos. Plaza Mayor is the other main square in Madrid, and it’s only around 5 to 7 minutes walk from Puerta del Sol. On the way, we walked through a lot of beautiful local shops and boutiques. This square is surrounded by beautiful and historical buildings, shops and restaurants and in the open space, you will find a number of entertaining street performers. It can get quite crowded but it is worth a stop. 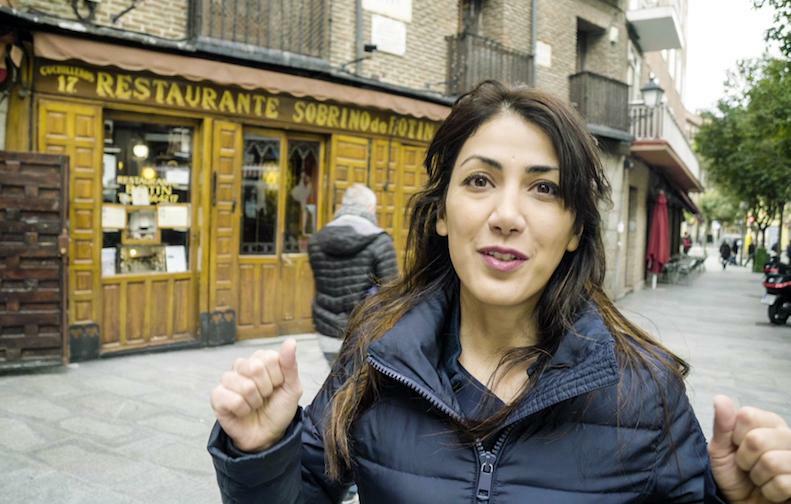 According to the Guinness Book of Records, Restaurante Sobrino de Botín is the world’s oldest standing restaurant, located only a 10 minutes walk from Plaza Mayor. Before our trip, I sent an email to the restaurant and arrange a time to go inside the restaurant and film it properly. The owner welcomed us and showed us the different floors of the restaurant. Each floor was built in different years, the basement is the oldest one, but the ground floor, built in 1725, is the one recorded on the Guinness Book. Eating in this restaurant is a unique experience, not only because you are eating in what looks like a museum, but you are going to have dishes prepared in the traditional way. Just think about it, you could have succulent roast meats which are cooked in a 300-year-old oven. If you don’t fancy eating in a restaurant and you want something quick but still tasty, you can head over to Mercado de San Miguel, one of the oldest and largest food markets in Madrid. You can find almost everything from prawn and caviar to chocolate and desserts here. The market is just off Plaza Mayor, and this 20-century glass wall market is so lively and it gets really busy around noon. If you are in Madrid on a Sunday, you must visit El Rastro Market, the most popular flea market in the city. Since we were in Madrid during the weekend, we had a chance to visit the market, which is huge and, you guessed it... crowded. Apparently, in the past the market was the place to sell and buy antique objects, but not anymore. You can find clothes, food, jewelry and a lot of other things here. Some of the stalls accept Visas or Mastercards, but others only accept cash, so it is better to have some cash with you to fully enjoy your time going around the market instead of wasting your time trying to find an ATM or queueing to withdraw some cash. If you are a football fan or even better a Real Madrid’s fan, you must visit Santiago Bernabéu Stadium (the Real Madrid’s Stadium). It doesn’t matter if there is no game you still can buy a ticket and visit the stadium. When there is a game you can enjoy the match but when there is no game you have a chance to visit different parts of the stadium including the changing room, the field, and the VIP section. 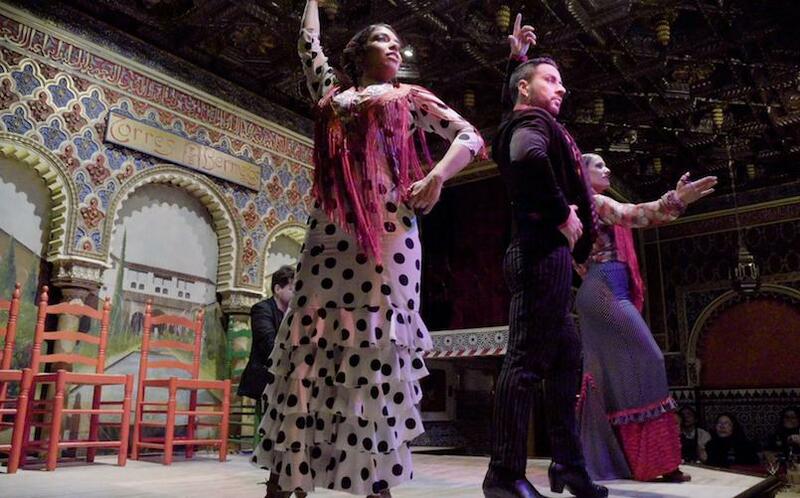 Watching a Flamenco Show is a must when you are in Madrid. I highly recommend you to end your night by going to one of the shows around the city. You will have an unforgettable night. There are different types of ticket you can purchase, usually you can purchase a ticket for the show with a drink included, or other ones which also include dinner. We went to Tablao Flamenco Torres Bermejas and we had a great time. When you are in Madrid and the weather is good (which is most of the time), you should visit Parque del Buen Retiro, the largest park in the city. The park is home to 15,000 trees and a beautiful lake. You can stroll around the park, hire a rowing boat or even lay down on the grass and sunbathe. Unfortunately, when we were in Madrid the park was closed due to windy weather conditions and we were not allowed to enter and have a walk around. The Royal Palace, as you can guess from its name, is where the Spanish royal family lives and it is not far from the centre, you can get there by walk or by metro. You should remember that the palace is considered one of the popular attractions, so it is better to buy a ticket in advance or go there very early in the morning, otherwise, you will have to queue for quite a while. Once we got there and saw the long queues, we decided to leave it for another time.